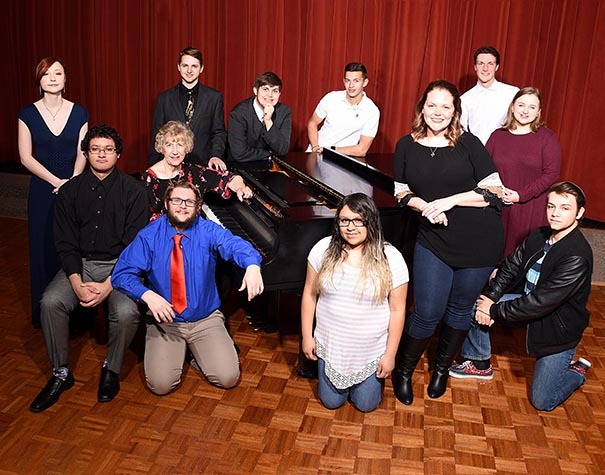 The Hill College Music Department will present the Hill College Choirs in concert, Tuesday, April 16, at 7:30 p.m., in the Vara Martin Daniel Performing Arts Center on the Hill County Campus in Hillsboro. The choirs are under the direction of Shirley Erickson with music faculty member, Larry McCord, as accompanist. Participating choirs include the Chorale, Men’s and Women’s Chorus and the Vocal Ensemble. 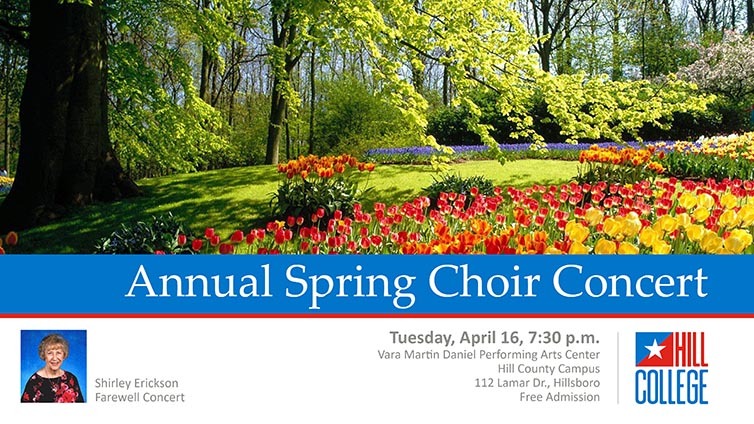 Several alumni will perform in what will be Mrs. Erickson’s final Hill College choir concert. The program will include a wide range of music including madrigals, ballads, folk, barbershop and just-for-fun selections. A reception will follow the concert and is hosted by North Texas Airstream Community Women’s Club. Admission is free and open to the public. Please plan to join us for this musical event! For more information, please email Director of Choirs Shirley Erickson at serickson@hillcollege.edu or call at 254.659.7884. Chorale, L to R: Back row standing: Emily Zimmerman, Hillsboro; Karson Vieregge, Hillsboro; CJ Anderson, Alvarado; Jacob White, Norfolk, Great Britain; Jessi McDonough, Alvarado Killian Panis, Halle, Belgium; Grace Butler, Waco. Seated: Kerith Wooldridge, Cleburne; Shirley Erickson, director of choirs. Front row kneeling: Cameron Phillips, Rio Vista; Tania Mireles, Cleburne; Jacob Renfroe, Cleburne. 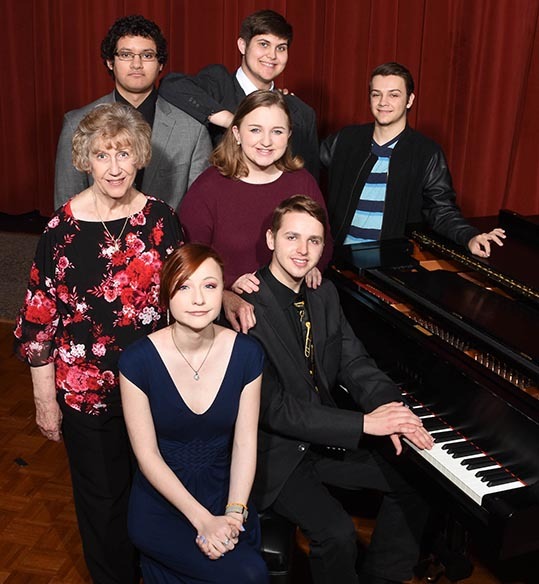 Vocal Ensemble (L to R): Back row: Kerith Wooldridge, Cleburne; CJ Anderson, Alvarado; Jacob Renfroe, Cleburne Middle row: Shirley Erickson, director of choirs; Grace Butler, Waco; Front row: Emily Zimmerman, Hillsboro; Karson Vieregge, Hillsboro.